Lynia has been recognized as the lead lawyer for energy, infrastructure and project by both Legal 500 and Chambers for 10 years and her team has been ranked on top three tiers for last 5 years. She has been awarded by the Chambers Asia Pacific (China) for Leading Individual in Energy & Natural Resources area; and Recommended Lawyer in Corporate (including M&A) & Projects and Energy (Hong Kong) area by the Legal 500 Asia Pacific. 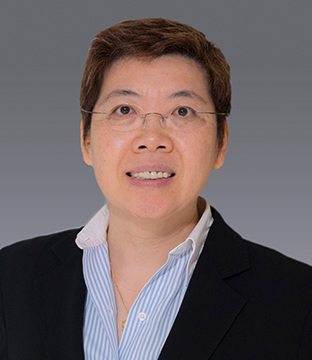 She is also Adjunct Professor of Hong Kong Financial Services Institute and Hong Kong Wenhui Management College. Lynia is also a contributing editor for the monthly journal International Energy Law & Taxation Review published by Sweet & Maxwell. Lynia is the Partner in charge of the Energy, Project and Infrastructure practices. She has advised many large-scale State Owned Enterprises and has significant experience in matters concerning development, acquisitions, government regulations, sales & purchases, finances and operations of large-scale infrastructure projects, especially in LNG, oil & gas, power stations, refinery, highway, tunnel, bridge, terminal and other public utilities. Lynia was previously with multi-national oil giant as a senior commercial director, accumulating over 30 years’ solid industrial experience in M&A transactions, project development, project finance and government regulatory related matters. Aside from energy and infrastructure, Lynia has provided legal services of outbound investment, capital financing, financial regulation, and outbound M&A, to several Chinese companies including state-owned enterprises, listed companies and private enterprises. Lynia dealt with matters regarding LNG and infrastructure projects as well as cross-border mergers and acquisitions. She can advise clients on contentious as well as non-contentious legal issues. Lynia Lau is qualified in Hong Kong and England & Wales. Advising LNG project sponsors and project companies (the first three LNG projects and other large-scale projects) on their legal issues including drafting, negotiating and advising LNG SPA, EPC, GSA, JV Contracts, time charter parties, project finance documents in both Chinese & English from the starting stage; covering legal training, project structure, bidding preparation and documentations, project development. Advised a large-scale provincial state-owned energy and power company as lead partner on its purchase of upstream LNG gas source, the storage capacity of which is up to 6 million tones. Advising a Hong Kong listed energy company as lead partner for its upstream Product Sharing Contract, EPC of FLNG agreements, LNG SPA and project finance of the overall project. Advising a state-owned petroleum company as lead partner in its LNG SPAs with European LNG suppliers as well as the cargo default as a result of force majeure event claimed by the Sellers under the LNG SPA for a LNG project in Africa; and advising on its LNG spot cargo trading and cargo swap arrangements and agreements with various Japanese and Korean oil & gas companies. Advising a state-owned oil company for its LNG SPA and negotiating with PSC and BP on client’s behalf; and advising on its 25 years term LNG Sales & Purchase Agreement, amendments and renegotiations, price review with the PSC partners and operator in Indonesia. Advised one of the world’s leading integrated oil and gas companies on its LNG SPA with a Egyptian gas company; - and advising on the financing of the 716.8MW Phu My 3 combined cycle gas-fired power station, one of the first major IPP established in Vietnam. Advising an energy company on the purchase of approximately one Bcf of LNG from BG LNG Services, LLC (BGLS); which was made in connection with the acquisition by BGLS and BG Gas Marketing Ltd. of El Paso Merchant Energy's capacity at Southern LNG's Elba Island, Georgia, regasification terminal. Advising one of the largest PRC power groups as lead partner (listed in Shanghai Exchange) on its investments in the 2 X 1,000MW IPP project in Indonesia. This will be one of the first 1,000MW unit in Indonesia and which one of the largest power projects is also for the PRC investors. Advising a world-class clean energy group (listed in Shanghai Exchange) as lead lawyer on its first overseas investments of a 2,100MW hydropower project in South American. Advising a power and energy company (listed in Hong Kong) in its overseas power project investments and the related feasibility studies including the hydro-power project investments in Laos. Advising a large-scale state-owned machinery and manufacturing company and its wholly owned subsidiary on the first PRC sponsored integrated 3 X 150 MW coal fired power and coal mine BOT projects in Pakistan, covering all the project documents including MOU, leasing agreement, concession agreement and the relevant project financing structure. Advising a joint venture company owned by several great oil and gas companies on the first foreign investment in the gas transmission sector in Indonesia under its new oil and gas law. For a purchase price of US$187.6 million, the company acquired from the Indonesian state-owned transmission company a 40% interest in its wholly-owned subsidiary. The deal includes a commitment to help finance a new 500-km pipeline from Grissik through Batam to Singapore. Advising a Shanghai A-share listing power company in its proposed acquisition of 4 X 350MW IPP project in Indonesia, which covers the drafting and negotiation of LOI, project framework agreement, due diligence, refinance framework agreement, sales and purchase agreements and project finance related documentations. Representing a Malaysia state-owned oil company in its US$8.5 billion transaction for the purchase of approximately 1.6 Tcf of natural gas over 20 years from Indonesia's South Natuna Sea Block B production sharing contract, together with the construction of pipeline and associated infrastructure. This is the first sale of gas from Indonesia to Malaysia, and the new-build pipeline forms part of the planned Trans-ASEAN integrated gas pipeline project; and advising on the sale of gas from the Kepodang field to Indonesian state power company, for power generation at the Tambak Lorok power plant in central Java. Advising an Indonesian company’s PSC contractor on the sale of 2.3 trillion cubic feet of gas over a 17-year period to a majority state-owned Indonesian gas transmission and distribution company. Advising an investment holding company with operations and investments covering Asia and Europe on the proposal acquisition of oil & gas field assets of a listing company. Advising a Malaysia estate, banking and financial group listed in Singapore on its proposal acquisition and development of oil & gas field together with the local government of Indonesia. Advising one of the largest upstream oil & gas group in Japan in its PSCs and JOAs, gas sales agreements and the related documents in one of the largest Indonesian oil & gas field. Advising a global group of energy and petrochemical company on the general project structure and issues of term gas sales agreement in PR China and provide specific advice on the Shandong LNG project and the Guangdong 2nd LNG project; and provide trainings to the whole gas and power team of Shell China in understanding the LNG SPA and Gas Sales Agreement. Lead Lawyer to advise a state-owned petroleum corporation on its US$1 billion Northern LNG import terminal and pipeline project, from the project starting stage, covering legal training, project structure, bidding preparation of LNG supplier and drafting bidding documentations for the construction work including draft EPC in both English and Chinese. Advising an energy and financial company as lead lawyer on acquiring the equity trading with an international financial company, the member of World Bank, including drafting the agreement of equity structure and equity transfer, revising and negotiating. Advising an Australian listing company as lead partner on its placement, HK IPO, M & A, project development and finance related matters. Advising a Canadian listing company as lead partner on its coal and 600MW power project development, financing and M & A related matters in Mongolia. This is the first IPP project in Mongolia with a total investment of about USD1.5 billion. Advising a French state-owned post office and its subsidiary on its first M & A activities, operation of logistic and express delivery business in Asia and China, advising on the relevant law and government regulatory issues, deal structure, establishment of vehicle holding company, JV structures, MOU, confidential agreements, preparing due diligence report, negotiations strategies and all project documents. Advising a large-scale state-owned petroleum company on its US$3.4 billion IPO, the PRC Company’s first ever triple listing in Hong Kong, New York and London. Advising a large-scale state-owned central offshore oil company on a series of private equity investments raising USD460 Million before IPO. Advising three international financial service corporations on a dual listing by IPO of shares and ADSs of a large-scale state-owned offshore oil company on the Hong Kong and New York Stock Exchanges, raising USD1.436 billion. Advising a Hong Kong listing company controlled by one of the largest PRC State Council related group as lead lawyer in its energy related M & A projects and direct investment in PRC. Acting as sponsor and underwriter of a Hong Kong IPO for an Asia capital corporation. Advising on a project in Tanzania as lead lawyer for a Portside Industrial Zone including container terminal, highway and rail project. Advising a transnational private enterprise as lead on the US$800m acquisition of House of Fraser. Advising a large-scale state-owned offshore oil company as lead lawyer in one of the largest upstream acquisition in Australia including preparing due diligence report, drafting, negotiating and advising the ESPA in both Chinese & English. Advising a large-scale state-owned oil company on a proposed acquisition of a complex USD10 billion upstream equity of Woodside in Australia; and advising on the company’s first investment, development and acquisition of an upstream assets in Abu Dhabi. Advising a large-scale state-owned oil company as lead lawyer in one of the largest upstream acquisition bid in Australia including conducting and preparing due diligence report, preparing bidding strategies, reviewing and commenting draft Sales & Purchase Agreement, drafting and reviewing terms sheet of firm bid. Advising an investment holding company as Head of Group Legal and Chairlady of Group Compliance Committee and the principal lawyer on various Hong Kong Listing Rule related compliance issues, internal structuring and connected transactions, M & A related transactions in its investment in a commercial bank in China, consumer bank in Indonesia and Thailand, upstream interest in Indonesia, PRC Highway, PRC Food Manufacture, property development projects in Beijing, and the founder shares in a H-share company. Advising an energy business company incorporated in Hong Kong for the establishment of an independent power related mutual fund by spinning off its current power assets. Advising a state-owned Central Enterprise under direct supervision of State-owned Assets Supervision and Administration Commission of the State Council as lead lawyer on its Cement related Project invested in Tanzania and Kenya, including structuring, term sheet, financial documents etc; and advising on its two subsidiaries for dispute matter in Singapore, successfully help the client to repatriate the debtor (guarantor) back to China, advice on the general strategy of the debt collection. Advising a company listed at TSX and NYSE as lead lawyer in develop partnership in Greater China area for the direct investment, project finance of new pipeline projects in Canada. Advising a world-class clean energy group (listed in Shanghai Exchange) on its first overseas investments of a 2,100MW hydropower project in South American. Advising a large-scale state-owned machinery and manufacturing company and its wholly owned subsidiary in the first PRC sponsored integrated 3 X 150 MW coal fired power and coal mine BOT projects in Pakistan, covering all the project documents including MOU, leasing agreement, concession agreement and the relevant project financing structure. Advising several large-scale energy and power companies as lead lawyer on its acquisitions and development of mining projects of coal, tin, copper, gold, aluminum in China, Indonesia, and Australia. Acting as Head of Group Legal and Chairlady of Group Compliance Company for several banks and capital enterprises on the regulatory and compliance issues, cooperation with PRC banks, security houses and insurance companies, and reviewed, negotiated and finalized all the term loan, sydication loan and ISDA arrangements for the group companies. Advising as an integrated, multi-asset class exchange group and its wholly owned subsidiary as lead lawyer on its proposed energy future exchange platform in Hong Kong and China, including advising on the relevant regulatory and compliance issues, applications with the relevant regulatory bodies, overall structuring of the platform and drafting all the relevant documentations and agreements with the founder members including various international banks and oil giants. The company is an integrated, multi-asset class exchange group operating cash and derivative markets for multiple asset classes including equities, fixed income and energy; providing clearing facilities, data products and other services to the international financial community. The subsidiary is a Canada's leading energy exchange and North America's largest physical and future clearing and settlement facility. Advised the largest Indian Oil Company in an UNCITRAL arbitration regarding disputes under a Joint Operating Agreement for development of hydrocarbon reserves in India. Advised one of major US Oil Company in an ICC arbitration brought by an Indian company concerning the manufacture and sale of drill pipes, casings, tubing and other equipment used in oil drilling and exploration. Advised a world-leading resources company and the consortium in London on US$1 billion pipeline disputes at Liverpool Bay against British Steel. Advised a world-leading resources company which has a premium listing on the London Stock Exchange, with a secondary listing on the Johannesburg Stock Exchange, and its sales office for the sales of diamond represent around three per cent of current world rough diamond supply by weight and nine per cent by value produced from a mine in Canada’s Northwest Territories, in particular for the regulatory and unfair competition related issues in Europe. Providing advice to a PRC national environmental association on the victims in relation to a substantial and sudden environmental incident caused by a sudden leakage of the waste water pond at the mine owned and operated by a mining group. Acting as the international counsel for a leading international bank on its first non-recourse project finance of the largest operating waste-to-power project in Asia. Cost of the project is estimated at RMB890 million (US$130 million) and the debt amounted is RMB600 million (US$88 million) on a 70:30 debt-to-equity ratio. Advising an international development finance institution as lead lawyer on its first natural gas distribution network project. It was the institution’s first long-term local currency debt financing arrangement in the PRC. The loan facility is part of the institution’s US$150 million financing package comprising of "A loan" and "B loan” lending, partnering with 12 commercial banks. Advised three financial banks and institutions on the overall environmental financing program framework, drafting and preparing the standard P2E2 performance contracts, provided legal advices on on-going basis. P2E2 environmental financing program uses Hong Kong's legal and financial systems to mobilize private sector capital, management and technology from the U.S., Mainland China and elsewhere to provide solutions for Mainland China's growing energy conservation and air, water and ground pollution problems. Advising a PRC policy financial institution as lead partner on its oversea debt collection project, advice on the dispute arising from the finance document, analysis on the collection risk, provide the bank with overall strategy, instructing local counsel in its potential litigation etc. ; and advising on its ship finance project . Advising one of the greatest state-owned commercial banks in PRC as lead partner to provide transactional and contentious legal services and on cross-border contentious matters, including application for a Mareva injunction in the Hong Kong High Court, letter of credit disputes, disputes as to conformity of documents, advising on whether documents can be rejected, etc. Advised a Mainland stock exchange in the trading platform for the commodities futures of crude oil, gasoline, fuel oil, diesel, and other petrochemical products. Advising China's largest financial assets, asset management companies in a GO financing translation, SPA, announcement and composite offering document etc. Advising a France national electricity company and a France energy and power company on the 2X360 MW Laibin B BOT power project as project sponsors in from the early bidding stage to the winning and completion stage; and advising the project company on dealing with the Guangxi Government and other Chinese authorities in relation to the Concession Agreement, Power Purchase Agreement, Loan Agreements, Investor Equity Transfer Agreements, Settlement Agreement and other Project Documents. This is the first foreign invested BOT landmark project in PR China, covering complicated legal documentations and legal issues and all the documentations and negotiation required high proficiency bilingual language skills. Advising the Governments of Hong Kong, Macau & Guangdong Province as chief lawyer on the Hong Kong – Zhuhai – Macau Bridge Project which consists of a link between Hong Kong, Zhuhai an Macau by bridges and tunnels and a number of facilities on artificial islands. The main part of the bridge is about 30km and tunnels of about 7km with an estimated cost of US$5.6 billion. The advisory work spans three jurisdictions governed by three different legal systems covering the design of the legal framework for the project company and the inter-governmental agreement between the here Governments. Advising the largest construction and real estate state-owned conglomerate listed in Shanghai as lead lawyer on its contracting the Albania Highway PPP Project for the first toll highway in Albania, including drafting, negotiating and working on the project finance framework. Advising the consortium of bidding for the construction of the permanent aviation fuel facility franchise for Hong Kong International Airport. Advising an independent UK oil company as operator of a PSC supplier group in the US$ multi-billion gas sales agreement to a Singapore gas company. The deal includes a 22-years supply of natural gas through the newly build 400-mile submarine West Natuna Transportation System, one of the world’s longest subsea pipelines linking the three supply areas to Singapore. This is the first sale of gas by pipeline from Indonesia to Singapore and established key foundational infrastructure to enable future gas sales from the Natuna Sea area.